Now just about two weeks into the New Year, many are still struggling with – as tradition demands – a resolution. Maybe growing your hair and keeping it natural might be your change for 2019? 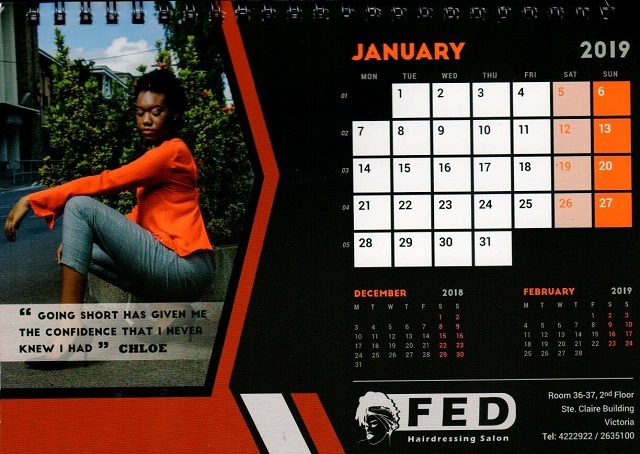 FED Hairdresser Salon has produced a calendar with 12 different ways you can style your natural hair that might be the inspiration you are seeking. Keeping it short, locks, dreads or a protective cornrow extension are options. This week’s buzz presents you with six styles for the next six months which can inspire you to go naturalista.